In a blatant surrender to my lazy nature, the description to this item is almost exactly the same as the one for the original Kit Rae Black Legion Axe. 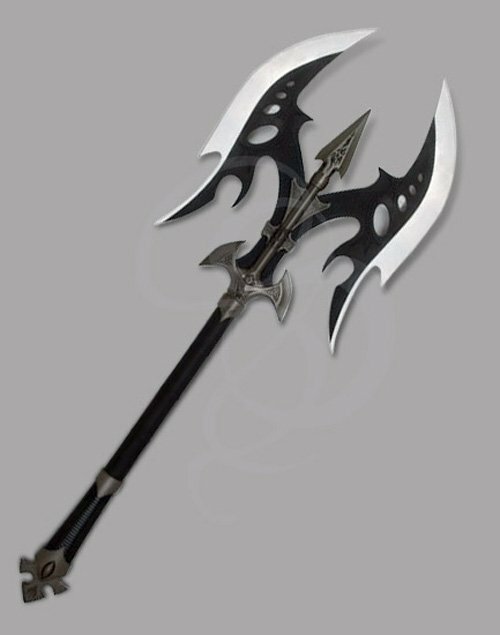 This being the BLACK Kit Rae Black Legion Axe, there is one obvious difference. That's right; it's a little longer than the original. Just joking of course, the main difference is the black-like quality to the blades of this version. This is a new item from Kit Rae and sure to be a fast seller. Afer all, black is the new black. As always, fantasy artist Kit Rae has brought to life a creation of ferocious beauty. Malevolent and dark, this axe is nonetheless an astonishing work of art, remeniscent of both H.R. Geiger and Frank Frazetta. This broodingly vicious axe is the perfect bit of flare for any dark warrior costume or a fantastic wall piece to throw a room together and wow the neighbors. Kit Rae has been making these axes for years, and each is as good as the next. The quality of his items are second to none, and this war axe is no different. The Black Legion Battle Axe features finely detailed solid metal parts and mirror-finished stainless steel blades (but now, they're BLACK! Part of them, anyway. Gee, writing product desciptions like this is easy and fun!). The blades are etched deeply with winding Celtic patterns and bored through for that wild look (and lighter feel). The finish on the haft features a special antiquing that makes the axe look battle worn, but not scuffed. The battle axe's handle is a tough black leather that makes holding this axe a joy. A "skull crusher" pommel completes the look of this barbarous wonder. Each axe includes a certificate of authenticity and is presented with a black-and-white collector art print, "The Barumen" by designer Kit Rae. The Black Legion Battle Axe is branded with the designer's trademark to ensure its authenticity, and to certify that it has met the rigid quality control criteria of his studio. AXE MATERIAL: Mirror-polished and deep-etched, 420 stainless steel, false-edged. HANDLE MATERIAL: Solid metal handle parts, antiqued metal finish, genuine leather-wrapped shaft.